HAROPA, a founding partner of the ESI (Environmental Ship Index) approach, has reaffirmed its backing for shipping companies which commit themselves by their side in favour of the environment. The ESI is a benchmark measure, which assesses the environmental performance of vessels, was initiated in 2009, in collaboration with five other ports in the north European range. Being forerunners as regards sustainable development and mitigation measures, the three ports of the Seine corridor awarded the trophy ‘Best Green Shipping Line HAROPA – ESI 2015’ on Wednesday, 7 September. The event took place at Port 2000, during its ten-year anniversary. 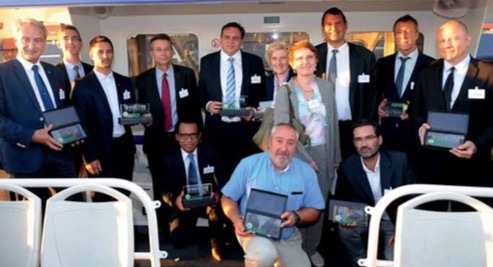 On 7 September in Le Havre, HAROPA awarded 13 trophies to 12 shipping companies for their green calls: 12 for Le Havre and one for Rouen. This approach and initiatives reassert HAROPA’s will to work jointly with shipowners to improve the port environment of tomorrow. It is important to remember that the purpose of this trophy is to encourage shipowners to reduce the emissions of their ships and to promote ever ‘greener’ shipping. Shipowners are particularly aware of this cause, and ever-increasing numbers of them are keen to participate in green initiatives, and some even voluntarily go beyond the regulatory requirements. Since its creation in 2012, 21 shipping companies have signed the HAROPA charter and, by the end of 2015, HAROPA rewarded a total of 890 calls. It is worth remembering that the ESI gives a score, for each participating ship, based upon several parameters including the performance of her engines, the facilities and equipment on board and the quality of the fuels used. The reward can be up to the equivalent of 10% of the port dues owed by the shipping companies, according to conditions defined by each of the participating ports. sensitive environmental context in which it was included. In addition to the measures made to reduce the impact of the works themselves, it has been the start of a real concerted approach with a view to the environmental restoration of the river Seine estuary though the environmental measures included into the project and the scope of which goes beyond mere mitigation. This year, the ‘Environmental Ship Index’ trophy has become the ‘Best Green Shipping Line HAROPA’ and integrates the ‘Green Label’ approach. Originally exclusively maritime, the approach is now onwards extended to river shipping; it was in March last that the first environmental trophy of the river fleet was launched by HAROPA – Ports of Paris. The trophies were awarded by: Re´gine BREHIER, HAROPA President, CEO of HAROPA – Ports of Paris; Herve´ MARTEL, HAROPA Vice-president, CEO of HAROPA – Port of Le Havre; and Nicolas OCCIS, HAROPA Vice-president, CEO of HAROPA – Port of Rouen. The shipping lines rewarded, in alphabetical order, are:APL; CMA CGM Le Havre and CMA CGM Rouen; EUKOR; EVERGREEN; HAMBURG SUD; HANJIN SHIPPING; HAPAG LLOYD; MAERSK LINE; MOL LINER; MSC; NYK and UASC. HAROPA, the fifth-largest port complex in Northern Europe, is a joint venture between the ports of Le Havre, Rouen and Paris. It is connected to every continent owing to a first-rate international shipping offer (linking 600 ports worldwide). It serves a vast hinterland whose core is in the Seine valley and the Paris region forming the biggest French consumer market area. With around ten Normandy and Paris area partner ports, the ‘one-stop’ hub now forms in France a global transport and logistics system, capable of providing a comprehensive end-to- end service. HAROPA handles over 120 million tonnes of cargo by sea and waterway each year. HAROPA business represents 160,000 jobs.